The first section of the Single Sisters’ House was constructed in 1744 parallel to the Gemeinhaus along the limestone bluff and facing south. This German Colonial style building has herringbone-patterned doors with a two-story attic and brick arches over windows. It is constructed of roughly coursed limestone that is pointed with a flush joint. On the south façade, you can still see the sundial dated 1744 when this portion of the complex was constructed. The Single Sisters' House is open to the public upon request as part of the Moravian Museum of Bethlehem tour on Saturdays and Sundays from 11 a.m. until 4 p.m.
Tours of the Moravian Museum of Bethlehem are held every hour, with the last tour at 3 p.m. From Monday through Friday, the museum and the Single Sisters' House is open by appointment. 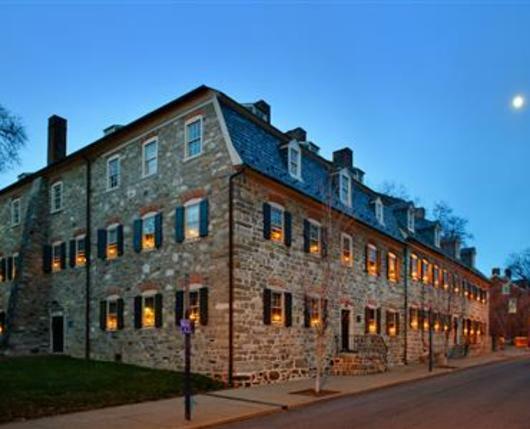 Admission to the Moravian Museum and Single Sisters' House is available through Pass Into History, an admission pass which lets you explore between two and five historic sites. Purchase your Pass Into History at the Visitor Center or at one of the historic sites during open hours. 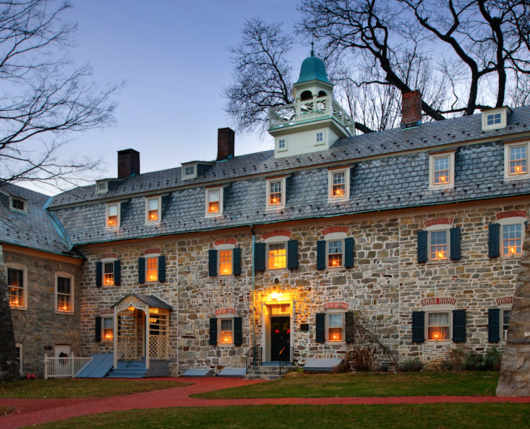 You can also explore the Moravian Museum and Single Sisters' House through a custom group tour experience. On the interior, the building, which was heated with tile stoves, has a center hall plan with a 10-foot-wide hallway flanked with chimneys at the midpoint. The floor of the center hall is made of brick pavers approximately nine square inches—much of the original structure of the building remains. The Sisters’ House was constructed originally as the Single Brethren’s House, but the population of single men in the community increased so rapidly that they outgrew the space. In 1748, the building became home to the single sisters, providing workspace and dormitory for women. The northern extension of the Single Sisters’ House, measuring 69 feet by 28 feet, was constructed of limestone in 1752 in the same architectural style as the 1744 section with shallow segmental brick-arched windows, herringbone-patterned door, gambrel roof on the east façade with shed dormers in the lower and upper attic. The northwest corner is attached to the east wall of the 1749 addition to the Bell House. In 1756, the building added two three-story stone buttresses on the west façade. On the interior, the floor levels between the 1744 and 1752 sections are the same. Interior stone walls remain intact except where connected to the Bell House and 1744 section of the Single Sisters’ House. This addition housed the dining room, Saal (chapel), workspaces for the Single Sisters and Schlafsaal (sleeping hall) on the third floor. 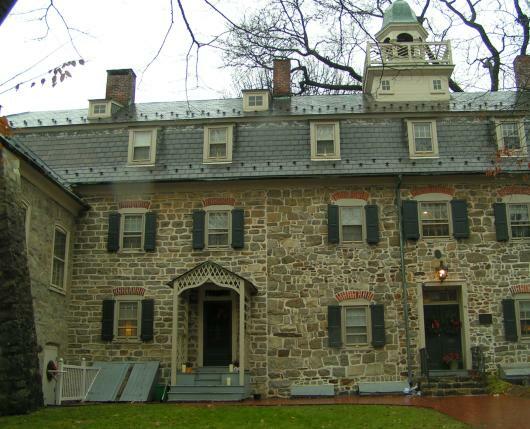 Single women lived in the building until December 2007, at which time Historic Bethlehem Museums & Sites begin preservation work to make the Single Sisters' House part of the Moravian Museum of Bethlehem.